Chocolate Almond Kisses - Do You Know The Muffin Man? Notes: Very simple flourless cookie, you can make them in two hours, including chilling and baking time. I used a 72% bittersweet chocolate, so I increased the sugar and butter a bit. 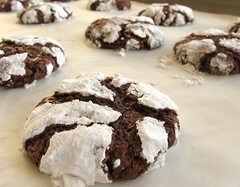 The cookies are soft, slightly chewy with a nice nuttiness to balance the chocolate.